WASHINGTON, D.C. - The Senate Judiciary Committee hosted a hearing on racial profiling in the U.S. today, marking the first time the legislative body held an official forum on the issue since before the terror attacks of September 11, 2001. Two panels testified before a subcommittee responsible for civil rights matters; one was comprised of current members of Congress representing minority communities. The second group was made up of current and former law enforcement officials, and civil liberties professionals. Each tried to address a broad range of profiling issues, ranging from illegal immigration to the surveillance of Muslim communities in the name of anti-terror efforts. During an address before Congress in February 2001, then-President George W. Bush told the chambers that racial profiling was "wrong and we will end it in America." Reflecting on that speech today, subcommittee chair Sen. Richard Durbin, D-Ill, said that the 2001 terror attacks ended bipartisan agreement on the issue. "In the national trauma caused by 9/11, we sometimes sacrificed liberty in the misguided notion that it would keep us safe," he said. At the center of today's debate was proposed legislation that would make it illegal for law enforcement agencies to target an individual based solely on race or religion. 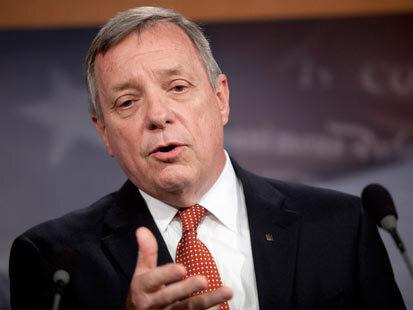 The "End Racial Profiling Act of 2011," co-sponsored by Durbin, would also seek to terminate existing programs at both the federal and state level that openly use the tactic in their investigations. Neighborhood watch organizations would receive additional training under the law. The bill was met with friction by some members of the panel, including a vice president of the Fraternal Order of Police. Calling the legislation "offensive" to law enforcement, Cpt. Frank Gale of the Denver police department told lawmakers that if enacted, the law would make it more difficult for officers and prosecutors to carry out otherwise sound arrests of minorities. "The bill is far too broad," Gale said, stating he was concerned it would prohibit officers from exercising "legitimate" criminal investigations. Gale, who himself is African-American, also criticized the act for proposing to cut funding to agencies that don't comply with federal standards. "How can we fight the battle if we also propose to deny these funds to agencies that need them?" he asked. Gale blames media and activist movements for over-inflating the issue. He says most arrests occur after laws are broken. Anthony Romero of the American Civil Liberties Union addressed Gale directly during his testimony, citing ACLU statistics from New York City to counter his argument. "Your very optimistic assertion that all is well is just not borne out by the data that we already have," Romero said. According to the ACLU, 88 percent of drivers stopped by New York police were eventually found to be innocent. In the overwhelming majority of incidents - 87 percent - blacks or Latinos were driving. The bill is also supported by Richard Davis, police chief of East Palo Alto, Calif. As another black officer, Davis said he saw both sides of profiling. Calling the tactic ineffective, "sloppy" police work, he said law enforcement should focus on actual suspicious behaviors before making an arrest. "When we deem a person to be suspicious or attach criminality to a person because of the color of his or her skin, the neighborhood they are walking in, or the clothing they are wearing, we are attempting to predict criminality," he said. "The problem with such predictions is that we are seldom right in our results and always wrong in our approach." Davis said that as a black father, teaching his son how to drive included lessons on what to do if he encountered bias from police and was pulled over for so-called driving-while-black. The officer called it a "mandatory course for young men of color." This was the second time Davis testified on the matter, having been present for the original hearing in June 2001. He expressed fear that without federal legislation, the issue of racial profiling would continue as "business as usual" until another high profile case - such as the death of Trayvon Martin in Florida - casts national spotlight on the issue. "As much as I am honored to be here today, I'd prefer if there was no need for me to testify in another ten years," Davis said. Roger Clegg, of the conservative Center for Equal Opportunity, said he opposed profiling in a traditional law enforcement context, but claims critics are ignoring a "white elephant" regarding the practicality of legislation. "I think we have to recognize that it is going to be tempting for police and individuals to profile so long as a disproportionate amount of street crime is committed by African-Americans," Clegg said, adding that the problem is related to the number of black children born out of wedlock. The comments drew audible murmurs from the room's audience, prompting Durbin to call the room to order. Clegg, a justice department official during the Reagan and Bush administrations, also stood by law enforcement monitoring of Arab and Muslim communities. Ranking Member Lindsey Graham, R-S.C., largely reflected Clegg's concerns regarding terrorism, and said he hoped sensitivity to the issue would not "unilaterally disarm ourselves." "What I hope we'll do in the course of this discussion is not ignore the threats that do exist," he said. Regardless, the senator acknowledged that there is only a fine line separating civil liberties and national security; he said he hoped a bipartisan way forward on the proposed legislation could be found. All members of the panel agreed that profiling eroded trust between law enforcement and their communities.